24 gramsⱡ of protein, including 16 grams of proprietary, plant-based non-GMO protein with precise ratios of 9 essential amino acids, optimized for high protein quality. The non-soy Life Shake contains an exclusive blend of non GMO protein from sacha inchi, potato, rice, pea and leucine. Omega-3 (ALA), an essential fatty acid that supports heart and brain health. The Life Shake is gluten free, lactose free, low glycemic, kosher, and has no added artificial flavors, sweeteners or preservatives. Provides vitamins, minerals, antioxidants, omega-3s, and healthy probiotics—all in one convenient Vitalizer Vita-Strip™. 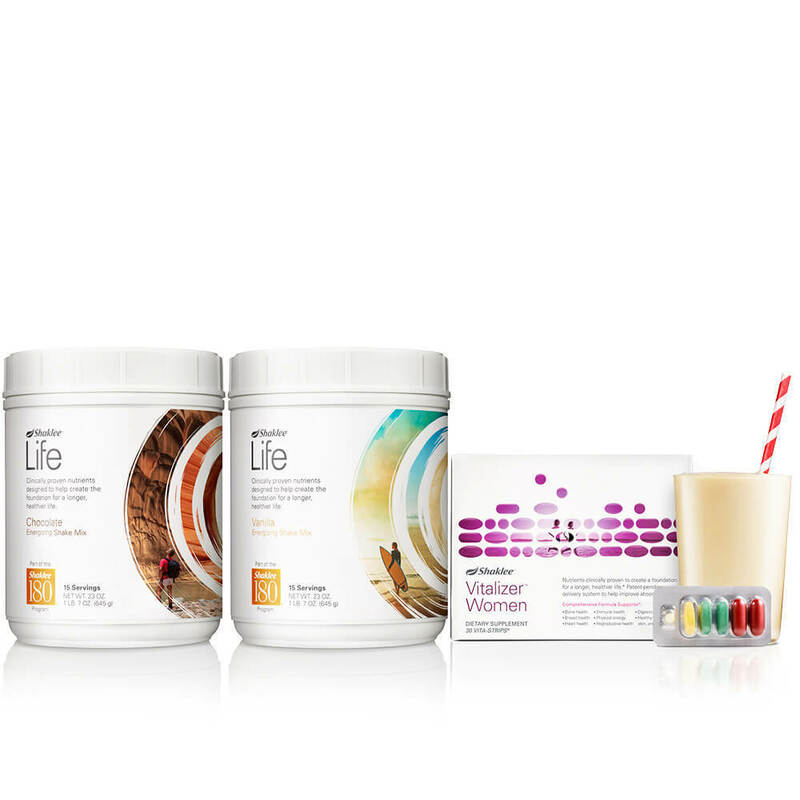 With formulas designed to meet the needs of men, women and adults over 50. Vita-Lea Advanced Multivitamin - Dissolves in less than 30 minutes in the stomach, designed to enhance absorption of folic acid from the patented microcoating. B+C Complex - Provides up to 198% greater absorption of B-vitamins over 12 hours, as shown in a clinical study, through sustained release delivery to the small intestine. Caroto-E-Omega - Enteric coating helps reduce fishy aftertaste by delivering omega-3 fatty acids, carotenoids, vitamin E, and other fat soluble nutrients to the upper intestine. Optiflora Probiotic - Delivers healthy microflora to the lower intestine through our triple-layer encapsulation technology, protecting them from stomach acid. Vitalizer is the only multinutrient pack in the market that uses Shaklee Micronutrient Advanced Release Technology (S.M.A.R.T. ), a unique, patent-pending delivery system designed to dramatically improve absorption of key nutrients. The right nutrients, in the right place, at the right time. That’s S.M.A.R.T. Shaklee Life Energizing Shake: Mix 2 scoops with 1 cup of nonfat milk or your favorite beverage. Vitalizer: Take 1 strip everyday with a meal.